Your calendar is clear for the first time in weeks, the sun is shining and you’re ready to get outdoors. It’s time to go kayaking in Branson. With its gentle flowing waters, Branson’s Lake Taneycomo gives kayakers several opportunities to relax and let the current take care of some of the work. On Table Rock Lake, the calm, smooth water also make for easy paddling – but without the current, it’s easier to maintain a steady position while fishing, taking pictures or simply enjoying the beautiful surroundings. And you get a slightly better upper body workout. If you don’t have a kayak of your own, but are interested in giving it a try while you’re in Branson, rentals are available at Kayak Branson, White River Kayaking and Outdoors and Main Street Lake Cruises. Kayak Branson provides rentals and offers service on both Lake Taneycomo and Table Rock Lake, and if you already have your own kayak, they offer shuttle services to help make your day a little easier. Rentals are available from two hours to all day and can include single, two- or three-seat kayaks. White River Kayaking serves Taneycomo and Table Rock, plus Bull Shoals Lake, and offers standard, tandem and fishing kayaks. White River has different routes on all three lakes and provides shuttle services for renters (and visitors who travel with their own canoes). At White River, you also may choose to simply kayak around the Branson Landing area and its nearby creeks. Main Street Lake Cruises provide an ideal location to kayak Lake Taneycomo near the Branson Landing. 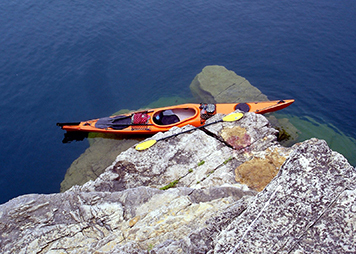 Along with various other watersport rentals, Main Street rents "sit-on-top" kayaks, a modern and unique style of the traditional watercraft. Rather than having cockpit seating, sit-on-top kayaks allow the paddler to be seated above the watercraft. 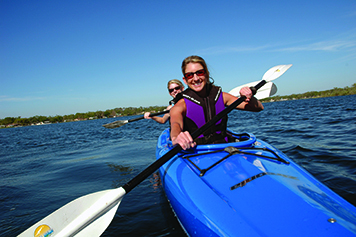 Kayak rentals at Main Street are available seven days a week and offer single, double and fishing sit-on-top kayaks. Jim M., who lives in the St. Louis area but is a frequent visitor to Branson’s waterways, says kayaking and kayak fishing are key reasons he travels to the area several times a year. “Kayak fishing is kind of ‘outdoor cool’ right now,” says Jim, who points out he was into kayak fishing before it was en vogue (he laughs at the notion he, like Barbara Mandrell, was country when country wasn’t cool). Jim says fishing from a kayak has a couple of advantages over canoes and row boats. Asked why he makes the four-hour drive to kayak and fish, when his home in St. Louis is closer to several popular waterways, Jim heaps praise on Branson’s options. Whether you’re interested in fishing, a quiet outing that allows you to enjoy the area’s beautiful natural surroundings, or trying something new, kayaking in Branson is for you. Find more fun activities in the Outdoors section of the site.